We are currently in the midst of the Lenten season in the Louque household. We try to make sure it’s a family affair, because it’s easier to practice good habits when everyone is involved. If you don’t believe me, try to go on a diet while your significant other eats fries and cheeseburgers in front of you. For Lent, there are three basic tenants: Praying, Fasting, and Almsgiving. The overall goal is to get your head in the game for the meaning of Easter. Even before I was Catholic, I always liked the idea of Lent. Even without being particularly religious, not having something you are used to getting makes you appreciate it more, and I think makes you more contemplative. The “fasting” aspect is not necessarily a lack of eating, but giving up something important to you or that makes your life easier. When I was in college, I had a friend that was Catholic (I’ll be honest, in my pre-Catholic days, I thought she was a little weird but hey, no judgment) and I did Lent with her. We lived on the fifth floor of our dorm, and I gave up the elevator. There’s nothing like hauling a backpack up five flights of stairs to make you grateful for the rickety, slightly vomit-smelling contraption that carries you to your floor. Now, the whole family participates and we try to keep each other on track. I gave up ordering on the internet (to the sadness of Amazon and Sephora), all the way down to George, who gave up having a messy room. There’s also kid rewards for doing certain “Lent chores” like washing your dishes every night before bedtime (the kids’ dishes are color-coded to avoid anonymous dishes in the sink, and their silverware has their names engraved in the handle) or doing chores for each other. Each day, you add candy to your jar for the tasks you complete, and at the end, the winners for various tasks get treats, and the entire family gets a reward if most of the chores were done. One task is family prayer, making the first leg of the lent trilogy part of the reward system, while giving up the time that you would have been doing something else. Not that giving up something for the Fasting part is easy, but for us, the Almsgiving is a little more difficult. Having four kids means that even if you had money, it’s long gone before you thought to look for it. The theory is that when you give up something for lent, you save the money from not doing that thing and you give it as alms. In our case, it’s money we probably should have spent on something else anyway, so it’s not really up for donation. We still want to hit that third point of Lent as an example to the kids, so in addition to the volunteer/service hours for things like the church food pantry or garden, we wanted to share what we do best: bees! Our kids all go to the same school, which holds a charity auction in March of each year. We don’t really have the money to bid on items or make monetary donations, so we decided that our best contribution was to throw some colonies in the mix and see what happens. 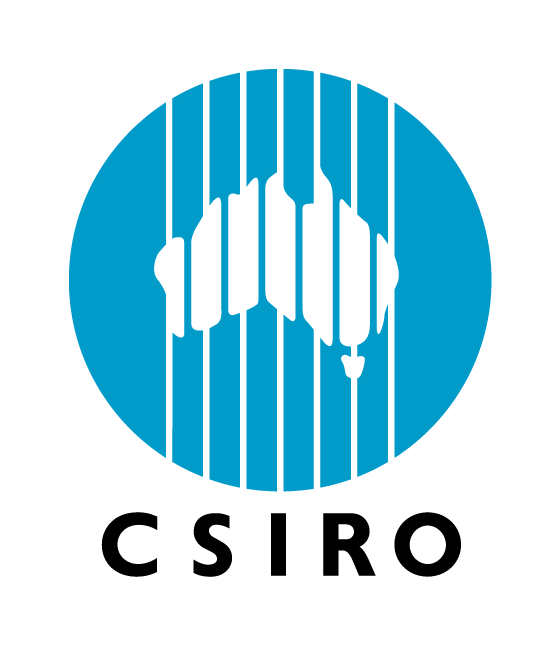 We tried to do it as best we could to set someone up for success who probably was not a beekeeper to begin with. Our “package” comes with two established colonies of somewhere between five to 10 frames of bees in painted equipment – I get to pick the colors. We did solid bottom boards, 10 frame deep, queen excluder, hive top feeder, lid, and drawn frames. The colonies will come from our own bees, so we will treat them for mites before we give them away, hopefully getting the girls a head start for the season. As a side note, the Varroa has been the worst I’ve ever seen this year, with mites all over the place since our first hive check in February! 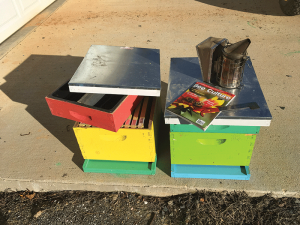 As a new beekeeper, you don’t really know what you will end up using, but seasoned veterans know that a hive tool and a smoker are about all you need in a hive, so we’re throwing one of each of those in too. For a little bit of assistance, I figured a year’s subscription to Bee Culture would be able to answer some questions for a newbee. The other significant part of a first-time hobbyist is the mentoring from an experienced beekeeper. We also gave two hours of each of our time for setup, questions, going through the hive, or whatever is needed/wanted to help the new person along. We all know that saying “two hours” is not likely how it will turn out when you’re talking about bees, but it seemed like a good starting point. The one thing that is missing is a veil of some type, and this is for two reasons. The first is that we don’t normally even take a veil with us to a hive, so it’s not really on our list of priorities for our package. The second is that everyone has their own preference about what they want in a veil. I have a jacket with a zip-on dome veil. I hate the round ones, unless it’s the veil that has no jacket and wraps around you. Some people don’t like the wrap veils and want the ones that have elastic to hold them under your arms. Other people want a full suit. A handful of people want gloves too, but I feel like you lose way too much dexterity to work the bees appropriately when you use leather gloves. I’ve also seen a lot of people who get a little too comfortable in their suits and gloves, and do a lot of damage to a hive in their overconfident attire. Just because you don’t have to be as careful doesn’t meant you shouldn’t. We like to teach our new people to treat a hive like a ticking time bomb that could go off at any second if you don’t use extreme care and caution. After they get a couple stings to the face, they usually abide by that advice, or start wearing a veil. If we’re lucky, they do both. We don’t have time (or the sympathy at this point) to wait on someone who can’t do their job because they can’t deal with stings. Hive colors may change at the discretion of J. Louque. If everything goes well, I’m thinking we will do this again next year for the auction and try to make some improvements. Perhaps we will throw in a veil of some sort, just to get them started. Maybe we will learn that we should have added a bale of pine straw to the mix for smoker fuel. 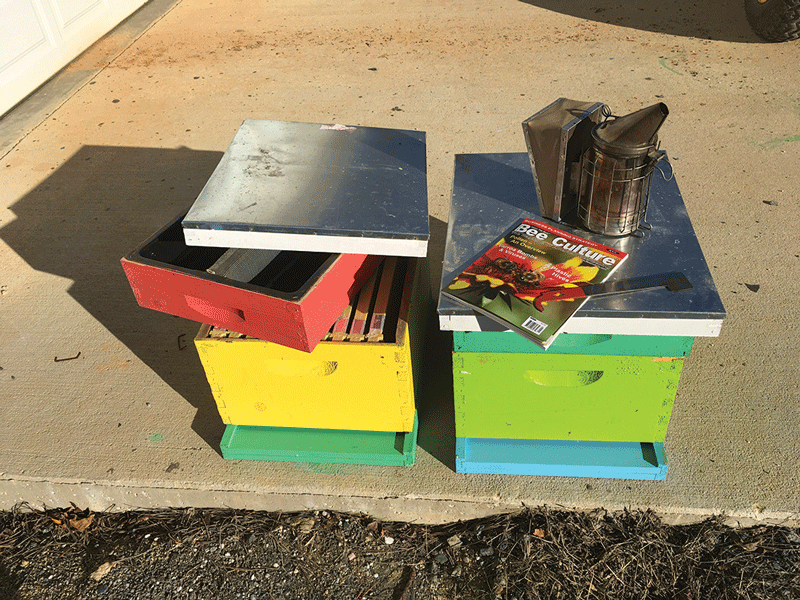 A metal trash can to hold said pine straw is also great, but that’s an additional purchase that could perhaps be put to better use by buying Kim’s beginner beekeeper book as a reference guide instead. Or, maybe a blow torch or grill lighter would be a good addition. Teaching someone how to light a smoker is 9/10th of the battle in intro beekeeping, but it’s a lot easier if the person is responsible enough to use a blow torch. Since it’s early in the year, maybe we should add some AP23 pollen patties to beef up Spring production (Maybe Dadant would want to donate some to our cause!). Varroa is always a problem, and adding Apiguard tins might be the ticket to overwinter survival for the first year under new ownership. All of these things could and would be useful, but I don’t know how much more money we can put into the package as compared to the success rate of the hive if we don’t add it. It might be free and useful to add a catalog from a couple bee places for equipment education and ordering purposes. All of these things can be evaluated after this year’s process. 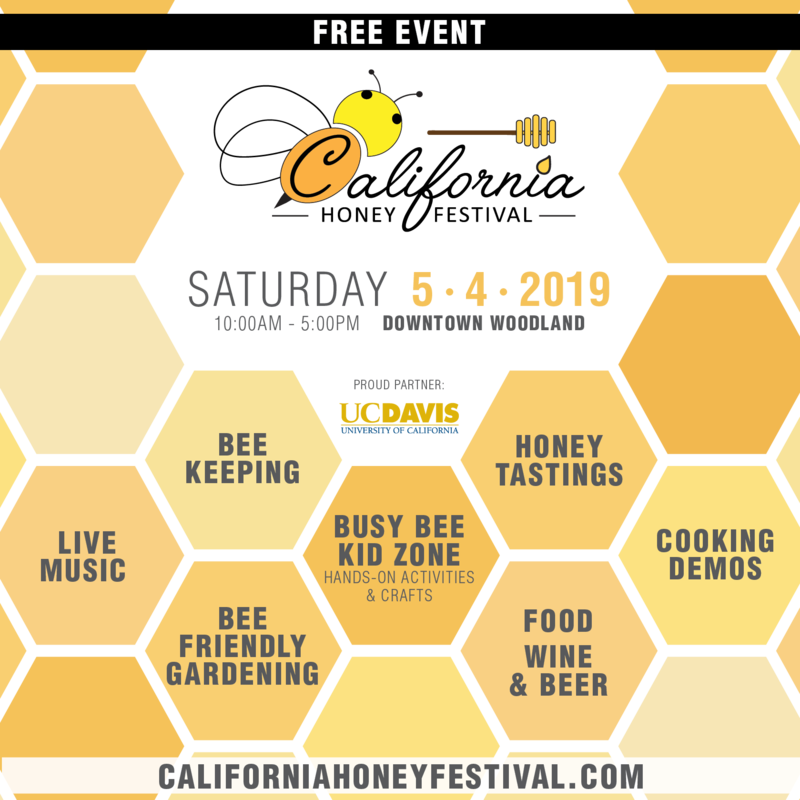 I’m hopeful that this will bring in some decent money for the auction, because it’s something that we can contribute that’s a little different than the normal, and we get to bring a new beekeeper into the fold on our own terms. It’s a lot easier to train someone from the beginning than to break bad habits. It’s also a little bit easier start for a new person because they have an established colony instead of trying to haphazardly install a package of bees without really having a lot of firsthand experience, or purchasing a nuc from someone and not knowing what it should look like upon arrival. The winner will also get some nice bees too, because we don’t want to see someone regularly who probably has something do to with the school telling us that we gave them crap bees (not that I’d give anyone crap bees because I think too much of myself for that). 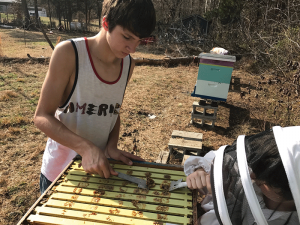 If everything turns out well, I think this is a win-win situation where we were able to fulfill the Almsgiving of lent, help out the school and contribute to the community, and give someone a good start in beginner beekeeping. As a matter of fact, by the time this issue of Bee Culture is published and mailed, the recipient will probably be reading this article in their first month’s subscription. 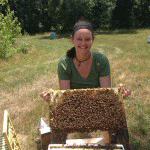 Jessica Louque is keeping bees, raising kids and practicing what she preaches in North Carolina. Come to Medina in September and you can meet her in person. 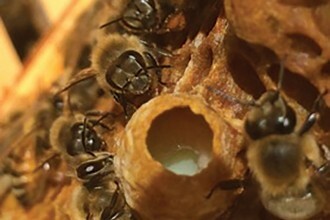 Splits & Varroa: More Colonies, Fewer Mites, New Queens – What Could Be Better?